Take part in IPCC Events focusing on peatlands at the Bog of Allen Nature Centre and at various peatland reserves around Ireland. Welcome to Féile an Dúlra 2019. Féile an Dúlra is supported by Kildare County Council under the Festival Grant Scheme 2019. You can follow us on Facebook for further information and photographs as the events take place. 20th April: IPCC’s Curlew Day ‘Call of the Curlew’: Come along to the Bog of Allen Nature Centre and join the IPCC from 2-5pm as we celebrate World Curlew Day. 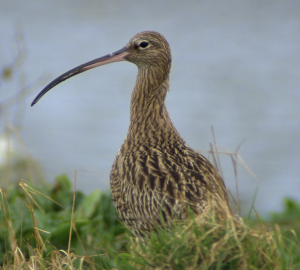 Relax with a cup of tea and sweet treat while IPCC provide an information talk on this wading bird while young visitors will have an opportunity to discover how the Curlew’s long curled beak is used to pluck food from bog pools. A guided walk to Lodge Bog at 3.30pm will complete the afternoon with the hope that participants will either catch a glimpse or hear the unmistakeable call of the elusive Curlew. 25th April 10am-1pm. Earth Day. Help IPCC welcome the return of Neddy and Lexi to Lullymore West Bog. Our lovely local donkeys will be helping to create a beautiful habitat for butterflies. Event leaves from the Bog of Allen Nature Centre. May: Biodiversity Week Events. Details to be announced of events at the Bog of Allen Nature Centre, Lodge Bog, Lullymore West Bog and Girley Bog. 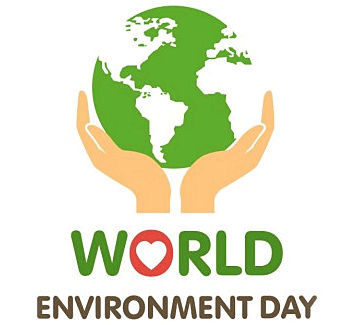 5th June: World Environment Day. 11am-2pm:Large Heath Butterfly Survey and habitat assessment of Lodge Bog. Help us record this endangered species of bogs on a transect and assess the habitat quality for the butterfly. Bring wellies and packed lunch. Event leaves from the Bog of Allen Nature Centre. 28th July: International Bog Day. Details to be announced. 17th to 25th August: Heritage Week. Details of IPCC’s events at Lodge Bog, Lullymore West and Girley Bog to be announced on the theme of past times. 20th September: Culture Night. Details of IPCC’s event will be announced later in the year. Contact bogs@ipcc.ie or call 045 860133. Thursday 4th October: World Animal Day. Support IPCC’s efforts to protect bog wildlife by adopting a bog species here. Contact bogs@ipcc.ie or call 045 860133. November: National Science Week. Science Week is an annual national celebration of the life-changing and fascinating world of science. Details of IPCC’s event for science week will be announced later in the year. Contact bogs@ipcc.ie or call 045 860133. 2nd February 2020: World Wetlands Day. Launch of Hop To It National Frog Survey 2020. IPCC invite supporters to get out and about to search for frogs and frogspawn. 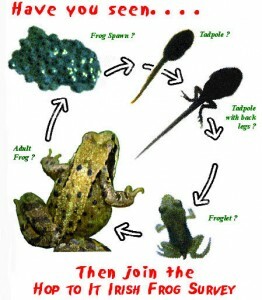 Please join the Hop To It Frog Survey which has been on-going for 22 years. Send your records to us. Many thanks. 20th March: International Frog Day. Hop To It National Frog Survey 2020. IPCC invite supporters to get out and about to search for frogs and frogspawn. Please join the Hop To It Frog Survey which has been on-going for 22 years. Send your records to us. Many thanks for your help. This entry was posted in Events and tagged biodiversity, Bog of Allen, Bogs, citizen scientist, Conservation, Events, Ireland, Ireland's Ancient East, Lullymore, open days. Bookmark the permalink.